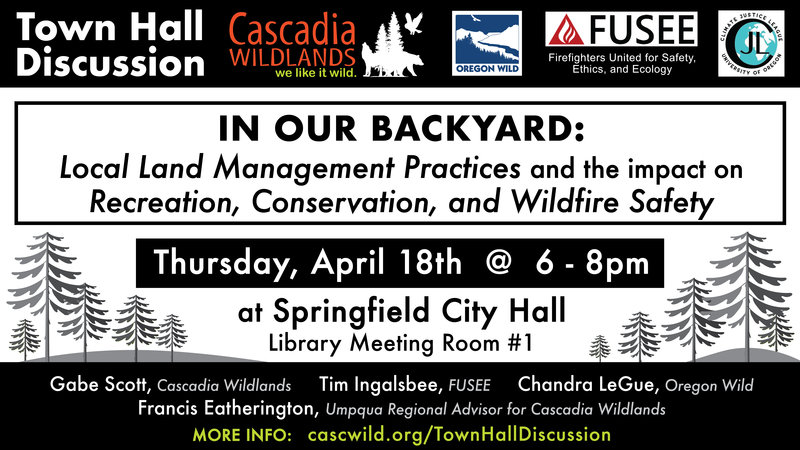 On Thursday, April 18thfrom 6-8pm, bikers, conservation groups, students, and Springfield area locals will join in a discussion at Springfield City Hall about timber sales and local forest management.The Town Hall will feature panelistsfrom Cascadia Wildlands, Oregon Wildand Firefighters United for Safety, Ethics and Ecology(FUSEE) discussing recreation, conservation and fire safety in Bureau of Land Management forests. The panel discussion will be followed by a moderated public forum in which community members will share and discuss concerns around local land management. The biker’s organization Climate Revolutions by Bikeis organizing a mass bike ride departing from the University of Oregon EMU at 5pm to participate in the Town Hallevent. Many bikers are joining the ride from the University of Oregon to the Town Hall to protest the Thurston Hills “Pedal Power” timber sale, the closest public lands logging proposal to town, and a proposal that the Town Hall will specifically discuss. The Thurston Hills sale plans to clearcut 105 acres of BLM managed forestdirectly adjacent to the popular 655-acre Thurston Hills Natural Area. The logging plan would link up 15 miles of new biking trails to the natural area, but also plans to put half of the newly created trails directly through clearcut. Conservation groups Cascadia Wildlands and Oregon Wild, co-hosts of the Town Hall, filed a joint lawsuit against the BLM for the Thurston Hills salepointing to concerns for recreation and fire hazard as a result of the clearcut proposal. Many Thurston area residents are also concerned about impacts that the project could have for fire safety. “I am worried that the Thurston Hills timber sale will not only be a local eyesore, but will also threaten the safety of my home and community,” says Sue Hartman, who lives only a mile from the clearcut proposal.